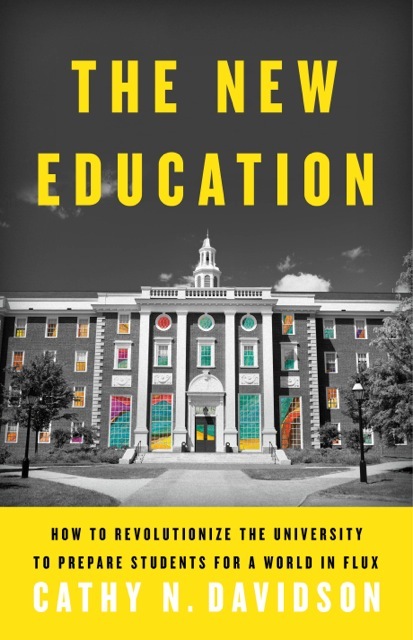 This Group has been set up for blogs, interviews, reports, and other news about a new book by HASTAC's cofounder and Director, Cathy N. Davidson,The New Education: How to Revolutionize the University to Prepare Students for a World in Flux. The book will be published by Basic Books on September 5, 2017. The title of the book is the same one Charles Eliot used for his 1869 manifesto that inspired his 40-year reign at Harvard where he led his colleagues in turning the old Puritan college into the modern American research university. Davidson argues it is time for a do-over. We need a "new education" to prepare our students for the post-Internet world in which the robots aren't just coming, they are here and taking away middle-class occupations. We need a new education to prepare our students to understand the new arrangements of the complex world we live in, so that they can be, as inventor and visionary Buckminster Fuller insisted, "architects of the future, not its victims." Davidson will use this space to provide news on higher education, to vent on gripes and pet peeves along the way---and to celebrate brilliant educators who embody HASTAC's principles of "Changing the Way We Teach and Learn" with "Diversity as our operating system." "The New Education takes a good hard look at the old education, and finds it sorely wanting. Are colleges and universities failing an entire generation of young people? Yes, argues Cathy Davidson, a renowned literary scholar and a leader in higher education reform. This is an important, illuminating, and urgent book whose argument is driven by a deep knowledge of the past and an even deeper commitment to the future." In The New Education, Cathy N. Davidson reveals that we desperately need a revolution in higher learning if we want our students to succeed in our age of precarious work and technological disruption. Journeying from elite private schools to massive public universities to innovative community colleges, she profiles iconoclastic educators who are remaking their classrooms by emphasizing creativity, collaboration, and adaptability over expertise in a single, often abstract discipline. Working at the margins of the establishment, these innovators are breaking down barriers between ossified fields of study, presenting their students with multidisciplinary, real-world problems, and teaching them not just how to think, but how to learn. The New Education ultimately shows how we can educate students not only to survive but to thrive amid the challenges to come. AUTHOR BIO: Cathy N. Davidson directs the Futures Initiative at the Graduate Center, CUNY, after twenty-five years as a professor and an administrator at Duke University. The author of many books, including Now You See It, she has also written for the Wall Street Journal and Fast Company, among other publications. She is on the Board of Directors of Mozilla, was appointed by President Obama to the National Council for the Humanities, and was the 2016 recipient of the Ernest J. Boyer Award for Significant Contributions to Higher Education. Davidson lives in New York, NY. In honor of the publication of The New Education, a contribution has been made to a scholarship fund established at the Graduate Center, CUNY. What Are The Key Properties That Make It Possible for Innovative Institutions To Do What They Do? What's the Best Way To Study for Finals?